Nardwuar The Human Serviette News: Available now ! "Doot doo" t-shirts, Record Bags & The Evaporators 8-tracks cartridges ! Available now ! "Doot doo" t-shirts, Record Bags & The Evaporators 8-tracks cartridges ! Available now ! 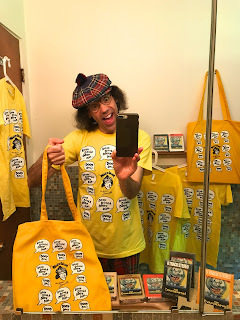 "Doot doo" t-shirts, Record Bags & The Evaporators 8-tracks cartridges ! Buy @ the NardStore at http://Nardwuar.com or hop to http://Mintrecs.com ! Doot Doo !